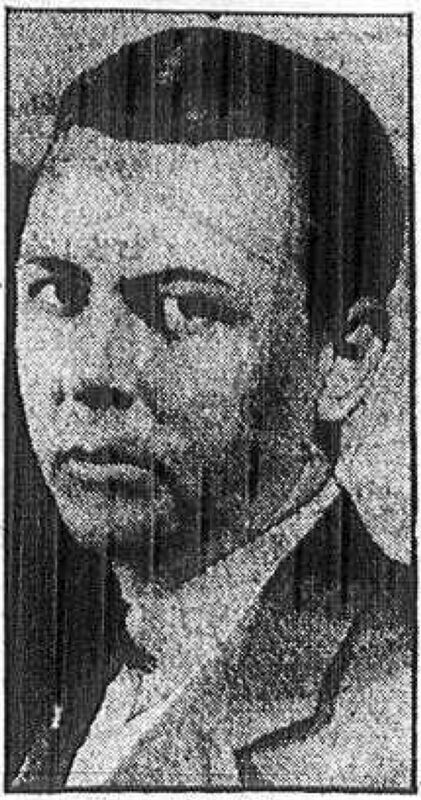 Richard Webster Thomas, former reporter and columnist of the Brooklyn Eagle and a candidate for Congress and the State Senate in the downtown area in 1932 and 1934, respectively, died of a heart attack yesterday in his home at 163 E. 81st St., Manhattan. Born 33 years ago in Manhattan, Mr. Thomas was active in newspaper work in Brooklyn for about ten years, remaining “in harness” during the vigorous campaigns he waged to put political theories formed as a newsgatherer to active use in legislative chambers. He was educated at the Collegiate School and Rutgers University and was employed by the Standard News Association and the old Brooklyn Standard Union before joining the Eagle staff and launching a busy career in all phases of reportorial endeavor. A stickler for factual reporting, he insisted on substantiating to the last degree the unusual customs and events he unearthed, frequently passing up “real gems" because of inability to establish their proof beyond all quibble or doubt. On entering the 1932 election campaign as the Republican opponent of Representative John J. Delaney, Mr. Thomas waged a forthright, hard-hitting fight based on a strong anti-Tammany stand and a denunciation of the 18th Amendment. Although swamped in the landslide for Franklin D. Roosevelt, the then 25-year-old campaigner, the youngest in the country during that election, made an excellent showing in the Heights area, carrying ten election districts. Before accepting the G.O.P. nomination for State Senator in 1934, to which was added the support of the Fusion, Liberal and Recovery parties, Mr. Thomas published the Brooklyner, a monthly magazine that flourished for about a year. He was married on March 13, 1933, to Betty Stuart Peck of Brooklyn and Belle Terre, daughter of Mrs. Bayard Livingston Peck and a descendant of Philip Livingston, signer, of the Declaration of Independence. They were divorced on Oct. 8, 1935. Formerly active in the Golf and Country Club of Belle Terre, Zeta Psi fraternity and the old Crescent Athletic Club, Mr. Thomas is survived by his mother, now the widow of the Rev. Dr. David G. Wylie, former president of the Lord's Day Alliance, and a half-sister, Mrs. A. Thornton Baker. His father, Richard Henry Thomas, a engineer, died in 1911. One of these days I just have to count up all the Katzenjammer Kids rip-offs and all the Believe It or Not copies and see which feature was more imitated. Today we have another one for the Believe It or Not column. This one is titled Stranger than Fiction, and it was the Brooklyn Eagle's entry, distributed by Watkins Syndicate. 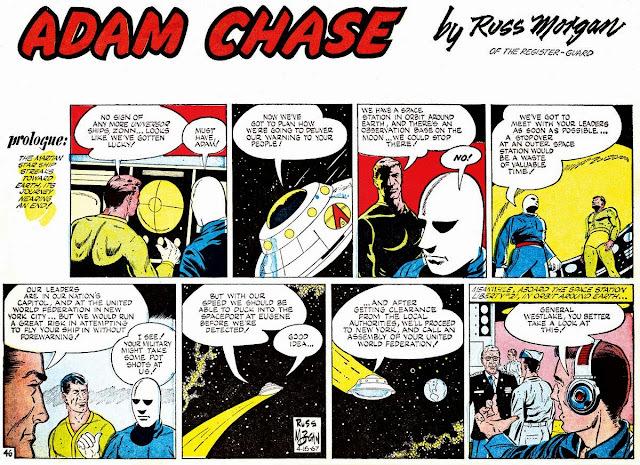 The creators were a pair of Eagle bullpenners, Walter Galli on art and Richard W. Thomas supplying the amazing facts. The Brooklyn Eagle had hardly any luck selling features to other papers. I don't know if Watkins Syndicate had a sales force at all, but if they did then the salesmen really needed some help from Zig Ziglar. In 1939, for instance, Watkins advertised in E&P a whole batch of really snazzy sounding new features, but not a one of them ever seemed to have made it into a paper (including the Eagle itself!). Stranger than Fiction began as a daily on April 1 1934 (a great omen! ), and a Sunday page was added on January 12 1936. The Sunday was the first to expire, on April 4 1937, with the daily sputtering out soon after, on June 5. For some reason the panel was advertised in the 1935 E&P listings under the title Oddities. I've never seen the panel itself actually using that title. I wonder what the Charles Hiller item is supposed to be about. 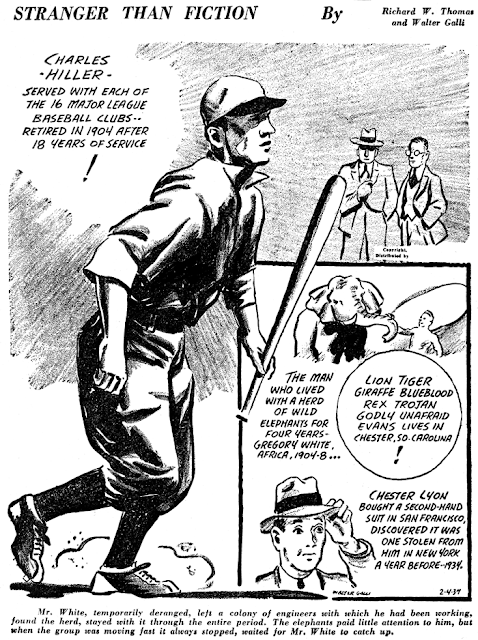 The only Charles ("Chuck") Hiller ever to play Major League Baseball didn't reach the majors until 1961, twenty-four years after this panel ceased publication. Even if the Charles Hiller referenced here was a nonplayer, he still would have had only four years in which to serve all of the then-eight American League baseball teams. (The AL didn't become a major league until 1901, with eight teams, and Hiller retired in 1904 according to this strip. The National League started in 1876.) That would have required a lot of job-changing in a short time. I wonder if perhaps the first two words of the strip's title were superfluous? Perhaps that 1935 Oddities oddity was just a text filler? Maybe just the block of type underneath the panel for use as space allowed? 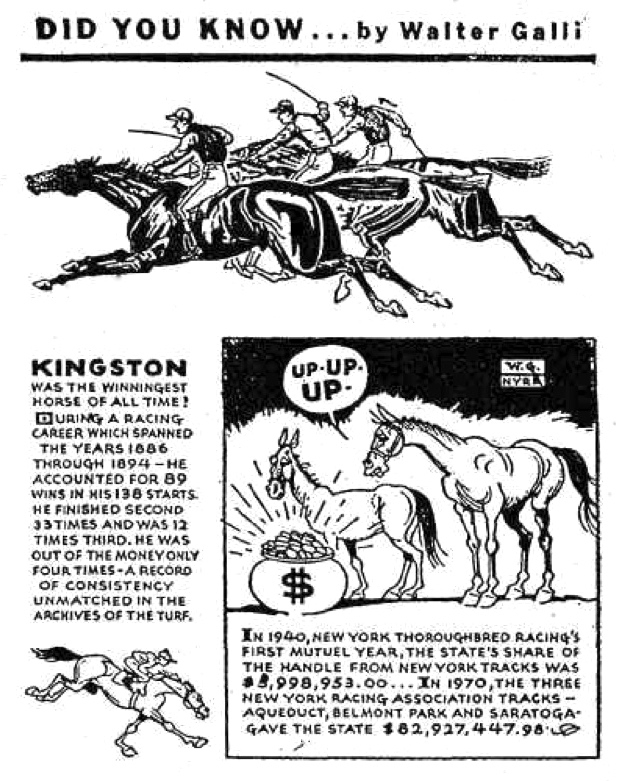 After all Stranger than Fiction's Sunday topper (Big Little Things)was running as a short text column of factoids under Thomas' name in 1935 and 1936. Noticed you didn't list Galli's (weekly?) panel Did You Know in The Book. 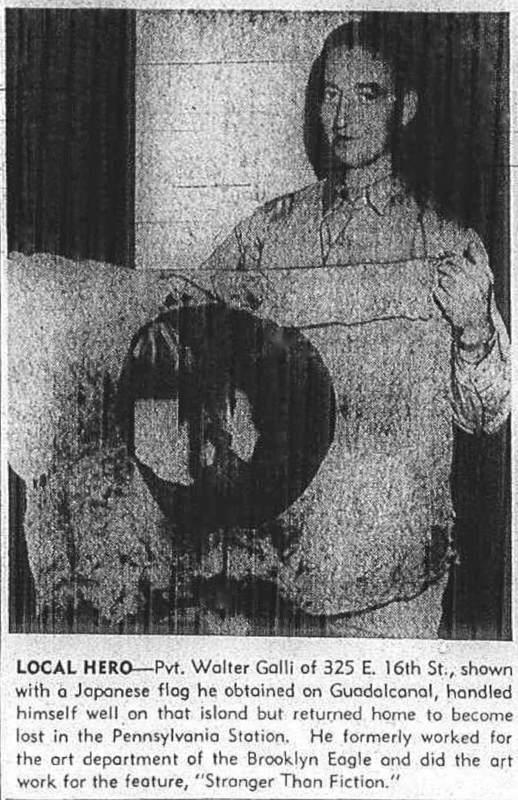 It ran in 1970 in Saturday's Troy Times Record and Sunday's Niagra Falls Gazette. 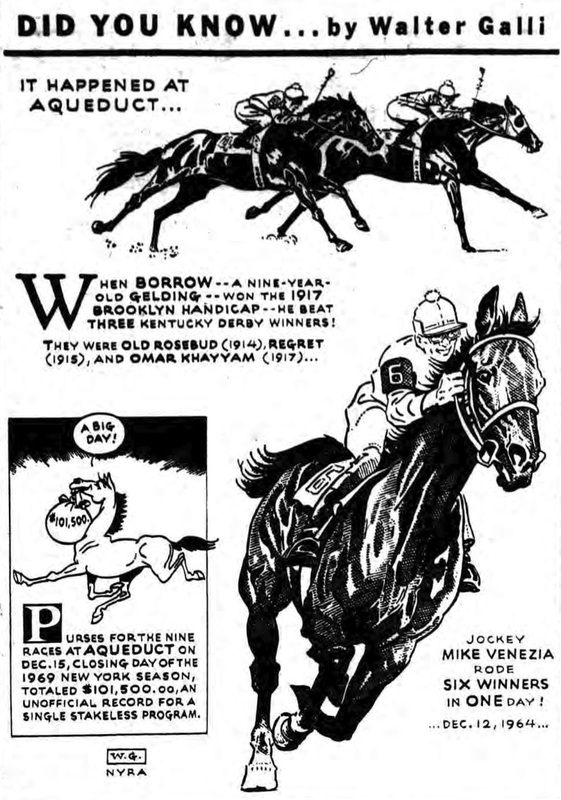 It followed the pattern of offering little nuggets of information but focused on thoroughbred horses, his signature was even followed by the initials NYRA. Hi Joshua -- I'm shocked ... shocked to be told that the Stranger Than Fiction crew's facts are not perhaps as factual as some would like. My guess is that by "major" they probably meant anything but that. He probably played on a bunch of local clubs. Or they got the name wrong. Or they got the number of teams wrong. Or they made it up. My policy for the book is generally to list only advertising comics when they are of significant historical or artistic interest. Galli's Did You Know series, which is obviously a sponsored giveaway, didn't really seem to rise to that level. On the other hand, if someone else were to do the research into just exactly how long it ran, this lazy guy would be happy to credit them and include the info in the 2nd edition. Western Newspaper Union, a premier supplier of comics and features to many small weekly papers, got it into their heads to expand the syndicate offerings after World War II. A number of panel cartoons, in particular, were added to the lineup. For one reason or another, very few papers ran these panel cartoons, limited space being paramount, and most of the panels were cancelled before the memory of the war was a half-decade old. Here's one of those panels, It's a Natural. I can't offer anything like definite running dates. I can only say that a few panels ran in 1948 newspapers. I assume it was offered every week but I've only seen isolated examples in March and August of that year. 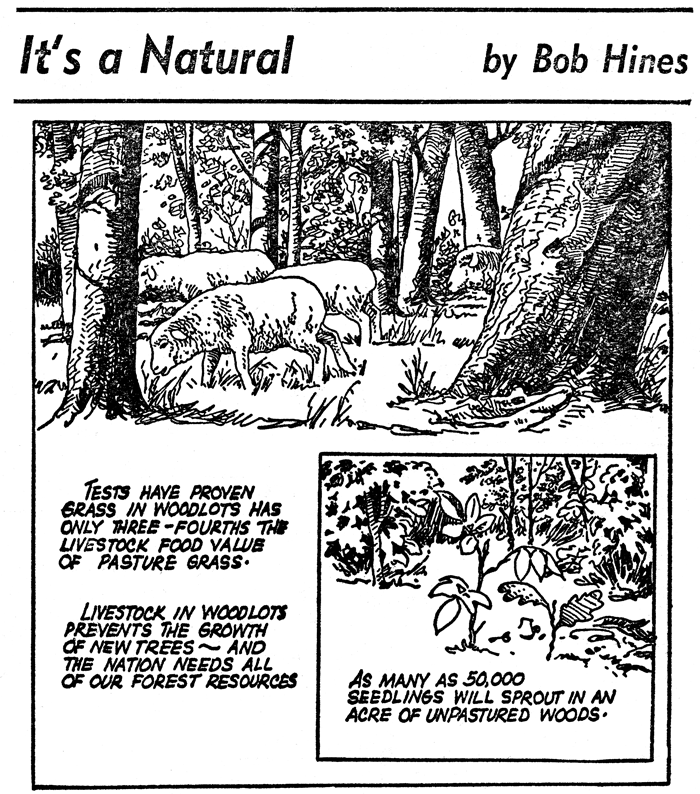 This factual panel about nature and ecology was produced by Bob Hines, who by 1948 was already a well-regarded wildlife artist. 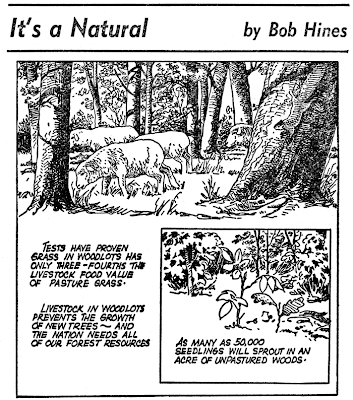 In addition to It's a Natural, he also reportedly produced a series of public service newspaper cartoons for the Ohio Division of Conservation. A bio and photo of Hines is at Ohio's Yesterdays.